In a forthcoming issue of the Journal of Peace Research, we present the results of a novel case study: Indonesia from 1993 to 2003, a period of major economic, political, and social transition. We found a close relationship between an increase in the minimum temperature during the rice growing season and an increase in violence. Perhaps more importantly, however, we suggest that some of the contradictory results from previous climate change and conflict research may be a result of methodological differences – namely, not looking at the relationship between the principle crop in a given place and temperature. Among social scientists studying conflict, climate change has been represented by measures of rainfall and mean temperature. However, when studying different crops we may find that different climate factors actually affect harvests and yields. In our study, we focus on rice, the staple crop in Indonesia. We rely on the natural science literature that claims rising minimum temperatures have a strong negative impact on rice production. Higher minimum temperatures increase the amount of energy plants needs to spend to maintain a healthy state, shorten the time to maturity, and reduce net growth and productivity. Since minimum temperature is reached during the night, it is a variable often lost when scholars consider a daily average temperature. With these different insights in mind, we investigate the impact of climate change on violence via agricultural production. The hypothesis underlying our work is that climate change may negatively affect rice production, rice prices, and eventually food availability and food prices, thus making the emergence of violence more likely. This framework of how climate change contributes to conflict holds when considering a single country whose economy is strongly dependent on rice. Rice in Indonesia is a staple food, and food constitutes 50 percent of household expenditures in urban areas and 67 percent in rural areas. 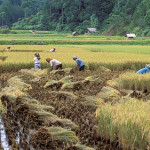 Rice production is a source of income for a substantial number of Indonesian households. According to data drawn from World Development Indicators, the employment in agriculture as percentage of total employment was around 46 percent between 1994 and 2003. In addition, Indonesia experienced substantial violence during a period of three major transitions in the 1990s. The first transition was political, from autocracy to democracy; the second was economic, from crony capitalism to a rules-based market system; and the third was social, from state centralization to decentralization. The overall severity of violence in terms of deaths peaked after the fall of Suharto’s regime in 1998 and decreased after 2001. However, the sheer number of violent incidents has risen since then. With this context in mind – environmental factors alone are never enough to provoke conflict – we analyzed the link between climate change and violence in 14 Indonesian provinces. We matched climate data from NOAA’s Global Historical Climatology Network with provincial-level conflict data from the United Nations. We studied the emergence of violence as measured by the number of monthly events (say for example riots and lynchings). Using an econometric approach that allows us to claim that our results are causal and not just correlations, we show that an increase of the minimum temperature during the core month of the wet planting season (e.g., December), determines an increase in violence fueled by the reduction in future rice production. This analysis supports the hypothesis that minimum temperature negatively affects rice availability (per capita), which in turn inflames violence. The evidence is robust. Some have suggested that what is missing in the climate change and conflict literature is a strong articulation of how climate change leads to conflict. This framework may be an answer to that question. Stated broadly, our work suggests that some inconclusive results in the climate change and conflict literature may suffer from not considering specificities of different crops. The dominant agricultural output and economic relevance of that crop changes across countries, from rice to wheat and others. Crops also differ in terms of growing season, cultivation technology, and reaction to climate variability. Further research seems necessary to explore other combinations of climate change variables, crops, and violence in different countries to see if this framework holds up. Raul Caruso is an assistant professor of economic policy at Catholic University of the Sacred Heart. Roberto Ricciuti is an associate professor of economic policy at the University of Verona. Sources: Climactic Change, Journal of Peace Research, National Journal, National Oceanic and Atmospheric Administration, PNAS, Science, United Nations Support Facility for Indonesian Recovery, World Bank, World Development. 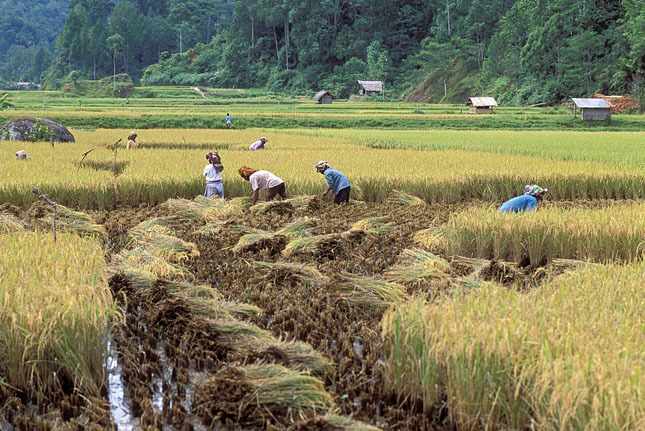 Photo Credit: A rice harvest in Indonesia, courtesy of Curt Carnemark/World Bank. An important verification of what many of us anticipate as a consequence of climate change, with a piece that may hold possibilities for prevention. Finding crops that do well in the new climate will not be an easy substitution for cultures that are thousands of years old. Hunger creates more willingness to eat what is available when it has the calories and nutrients needed. If this approach is started early enough, by the time it is seriously needed, the transition could be far less traumatic.